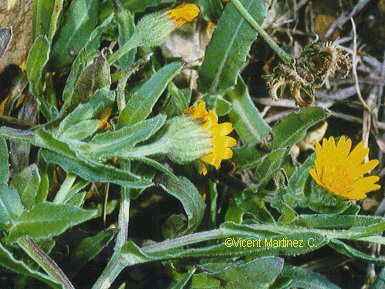 Photo of Calendula arvensis L.
Annual herb of the daisy family -composite- till 30 cm long. Erect or decumbent stems. Oblong -lanceolate leaves, toothed or edge unbroken, hairy below. Yellow or orange florets in single heads till 3 cm wide. Outer florets quite long. Very distinctive nut- like fruits, half- moon or ring-shaped. In cultivated lands.